Poor weather hampered the start of Operation Epsom on 26 June—both over the battlefield itself, where rain had made the ground boggy and there was a heavy mist, and over the United Kingdom during the early hours of the morning, resulting in aircraft being grounded and the planned bombing missions being called off. However, No. 83 Group RAF, already based in Normandy, were able to provide air support throughout the operation. The 49th (West Riding) Infantry Division resumed Operation Martlet at 0650, although without significant artillery support as this was diverted to the main operation. 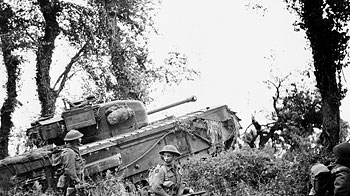 The Germans were able to slow the British advance, and then launched an armoured riposte. This initially gained ground, but was halted when British armour moved up, and the two sides engaged in a tank battle in the confined terrain. However, informed during the afternoon that a major British offensive was underway further east, SS-Standartenführer Kurt Meyer of 12th SS Panzer called off the counterattack, and ordered his tank companies to return to their initial positions south of Rauray. During the rest of the day the 49th Division was able to make progress, halting just north of Rauray. Brigade and the 46th (Highland) Infantry Brigade of the 15th (Scottish) Infantry Division, supported by the 31st Tank Brigade, moved off their start lines behind a rolling barrage fired from 344 guns. [nb 9] The 46th Brigade initially advanced without armoured support, because in bypassing the mine and booby trap-ridden village of Le Mesnil-Patry, its tanks were forced to negotiate minefields flanking the village. The infantry advance had mixed results; one battalion[nb 10] faced only light resistance while the other[nb 11] ran into the grenadiers of the Hitler Youth Division, who had allowed the barrage to pass over their positions before opening fire. Reuniting with their tanks at around 1000, by midday the two battalions were fighting for control of their initial objectives; Cheux and Le Haut du Bosq. The 44th Brigade, not facing the same problems as the 46th and advancing with their tank support, encountered little opposition until coming under machine gun fire at a small stream, following which German resistance was much heavier. 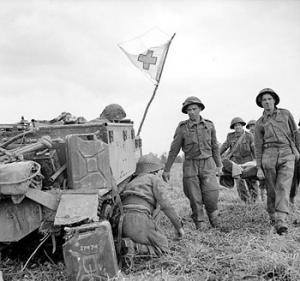 Between 0830 and 0930, the two leading battalions[nb 12] reached their initial objectives; Sainte Manvieu and La Gaule. 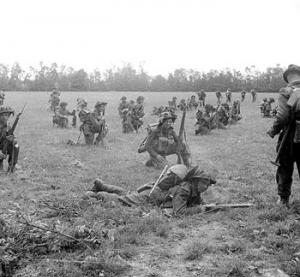 After much hand to hand fighting, they believed the villages to be completely in their hands just after midday, although they subsequently discovered that some German remnants were still holding out. Tanks and infantry from the 12th SS and the 21st Panzer launched two counterattacks in an attempt to regain Sainte Manvieu, but both were beaten off with the aid of intensive artillery fire. The main German opposition in this section of their outpost line had been from elements of the 12th SS Panzer Division's 1st Battalion 26th Panzergrenadier Regiment, which had been mostly overrun, and the pioneer battalion. 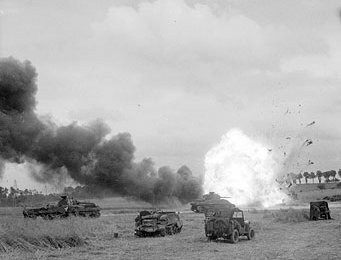 The Germans within Rauray, which had not been captured as planned the previous day, were able to subject the British brigades to observed artillery and indirect tank fire, causing considerable casualties and destruction, especially within the village of Cheux. At 1250 one squadron from the 11th Armoured Division's reconnaissance regiment, deployed north of Cheux, was ordered to advance towards the Odon as the precursor to an attempt by the division's armoured brigade to rush the bridges. Owing to minefields near the village, debris blocking its streets, and German holdouts attacking the tanks, it was not until 1400 that the regiment was finally able to make progress. By 1430 the squadron arrived on a ridge south of Cheux, where it was engaged by twenty Panzer IVs (diverted by the 12th SS Panzer Division from the Rauray area), Tiger tanks from the 3rd Battalion 101st Heavy SS Panzer Battalion, and additional armour from the 21st Panzer Division. More tanks from the 11th Armoured Division arrived, but determined German resistance halted any further advance; by the end of the day the division had lost twenty-one tanks. At 1800 the 15th (Scottish) Infantry Division's third infantry brigade, the 227th (Highland), was committed to the battle. 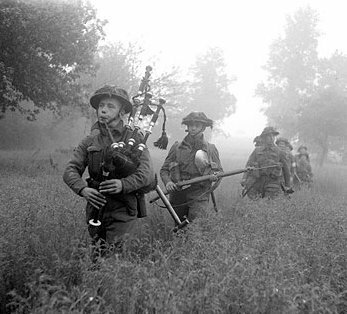 However, the Highlanders became bogged down with fighting in support of the rest of the division, and only two companies from the 1st Battalion Gordon Highlanders made much progress. 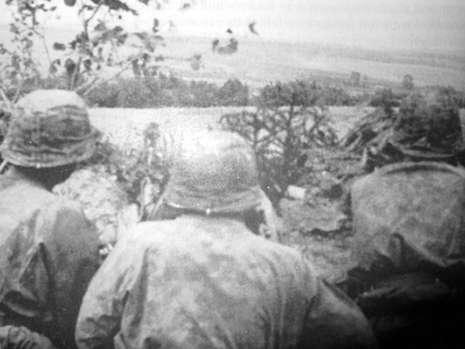 They entered the northern outskirts of Colleville by 2100, but soon found themselves cut off by German counterattacks. After heavy and confused fighting one company was able to break out and rejoin the battalion. To stop the British offensive, during the evening Field Marshal Rommel ordered assistance from all available units of II SS Panzer Corps.